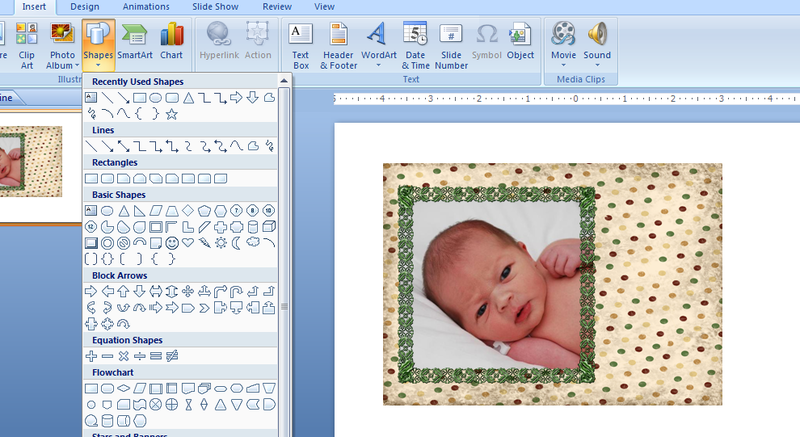 Now there are limitations to using an Office application when working with photos and graphics, but when you don’t have an editing software at your fingertips, it can be a great resource. There are endless possibilities for you to create and I’m only showing you a glimpse of what you can do and outlining the basic steps. I’m not a professional, these are just things that work for me. I searched for “free graphic PNG” and came up with lots of different things. 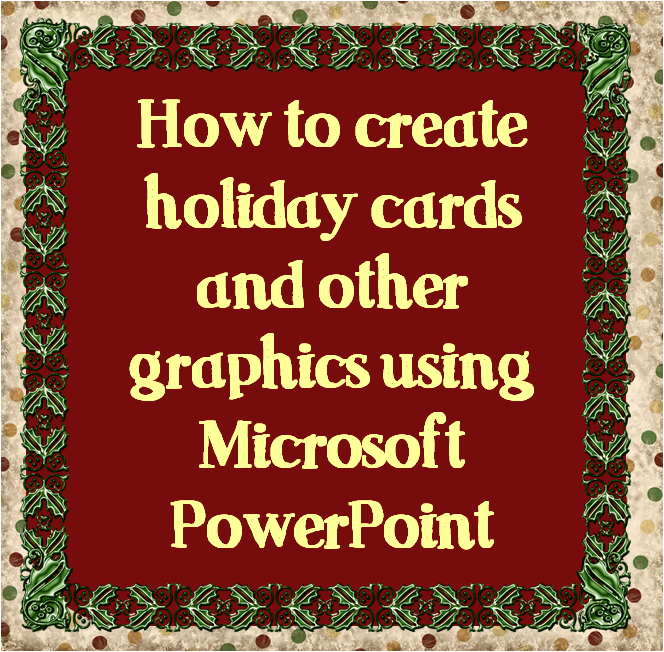 PNG is the ideal graphic format to work with because it has empty space (see the red behind the holly frame in the graphic about? JPEG and GIF would have white in the empty areas). 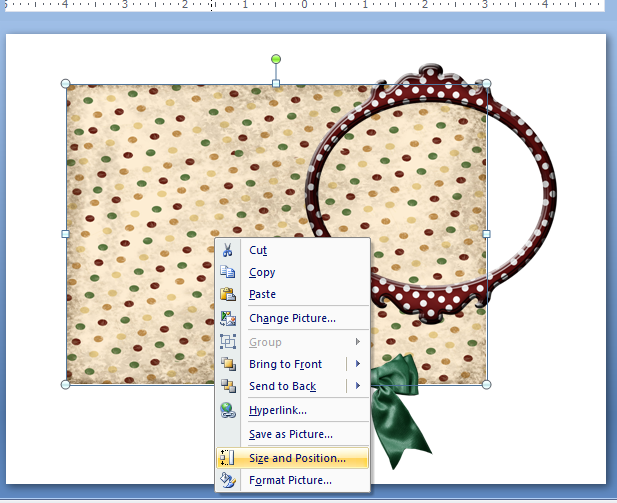 I found lots of goodies on a free digital scrapbook blog (another great search term to use “free digital scrapbook”). I downloaded frames, buttons, and backdrops from Granny Enchanted. 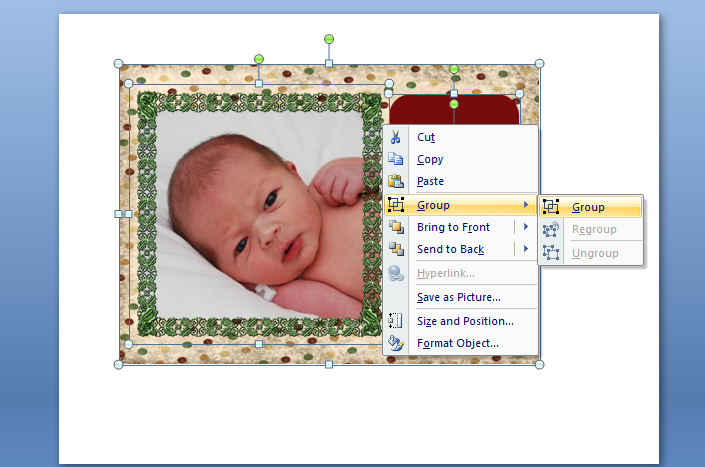 You can insert multiple photos and graphics by holding down “CTRL” when you select an item. When you insert your graphics, they are all selected. You can minimize them all at the same time by dragging a corner. Move them out of the way so you have room to play. My backdrop was a square. 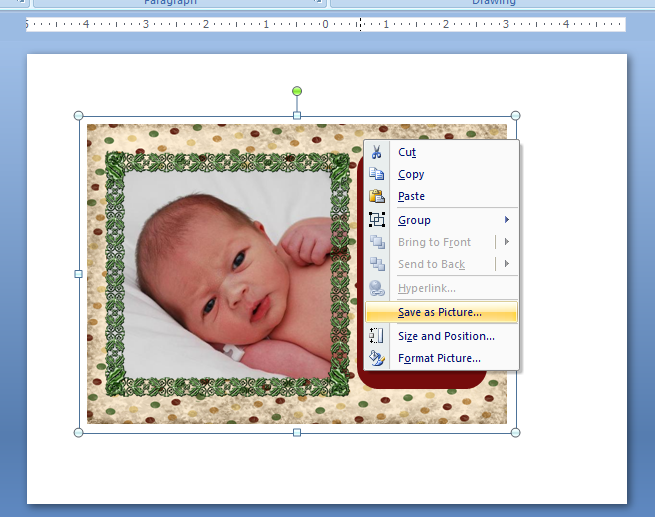 I want to print my holiday card as a 5×7 photo, so I right-clicked the image and selected “size and position” and put in my measurements. 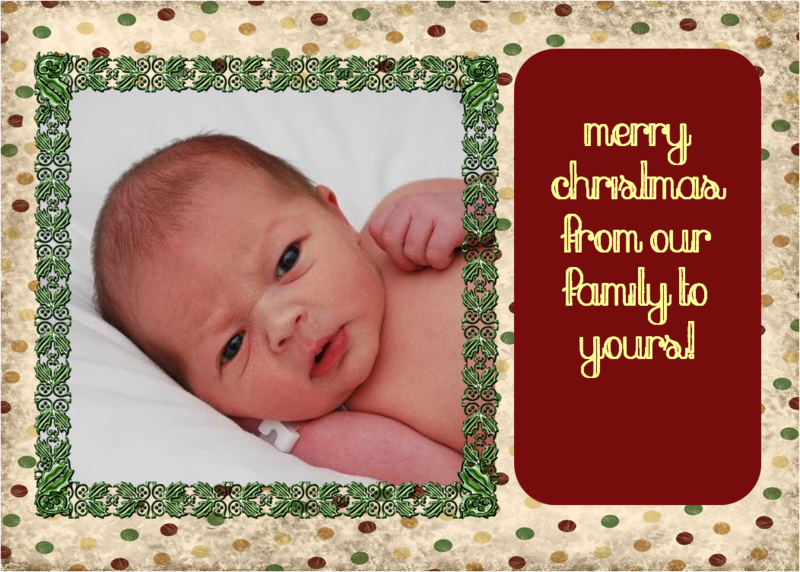 You want to make sure you set your background size as the photo you want to print as your holiday card. 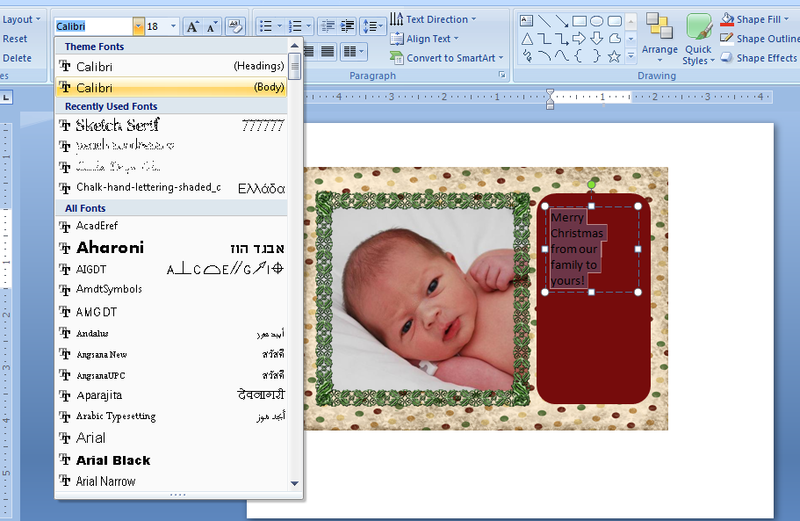 In this menu you can also “format picture” and lighten the graphic or crop. 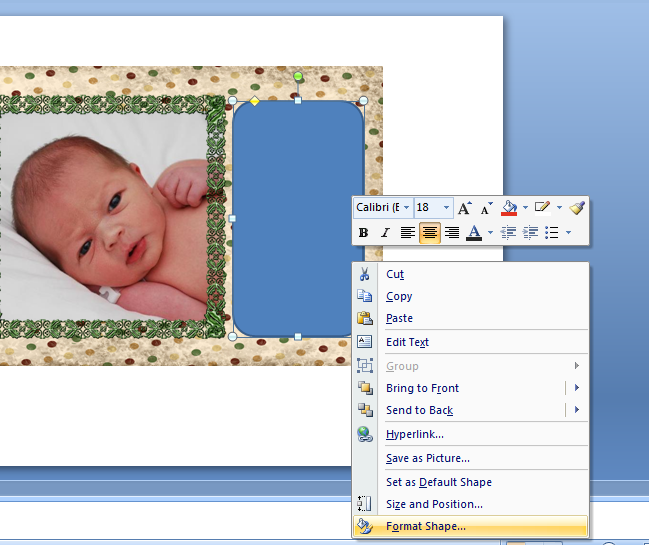 Be careful where you arrange the different elements of your picture; many photo printing places crop a bit from the sides. Play around with position and shapes. I had to switch out this round frame for a square one, to fit my photo. Is a graphic on top of something when it should be behind it? Right click the photo and “send to back” or “send to front” to change the layering order. My card’s background is pretty busy, so I want to insert a color block so that my text stands out. Here, I insert my desired shape, then I right-click and “format shape” to change the color. You can change the dimensions of the shape by clicking and dragging a corner or side. If you want it to be a certain dimension, you can find size options in the menu when you right-click the image. 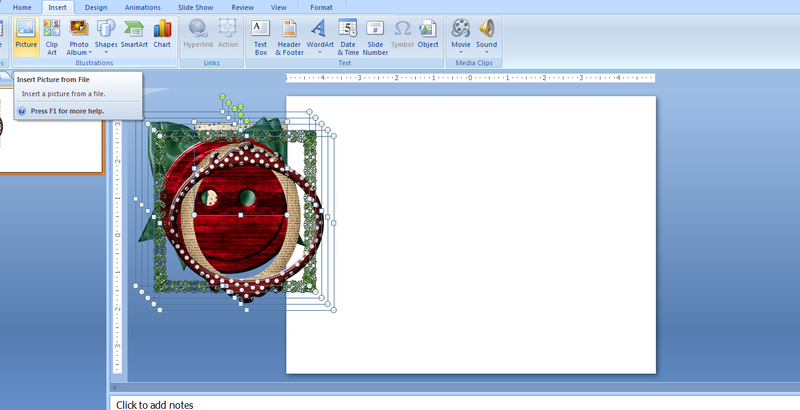 Insert a text box and, like the shape, drag a corner or edge to create the desired area. Type out your text first, highlight it, select a font, and then play with size and alignment. Looking for neat fonts? Click HERE for free fonts and how to install them. 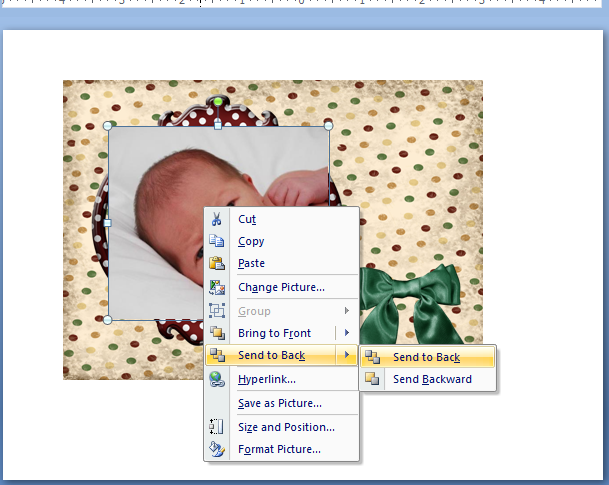 Hold down CTRL and click all items on your card, right-click and select “group.” If one item is the same size as another and layered on each other (like your photo and a frame) you may need to group those together first and play around with it. Your items are all grouped. Now right click some where on your image and select “save as picture.” Save as a JPEG format because some photo printing places (like Walgreens) do not accept PNG files. 9. You are done! Upload you picture to any photo printing site and order prints! Thanks so much for the great info. 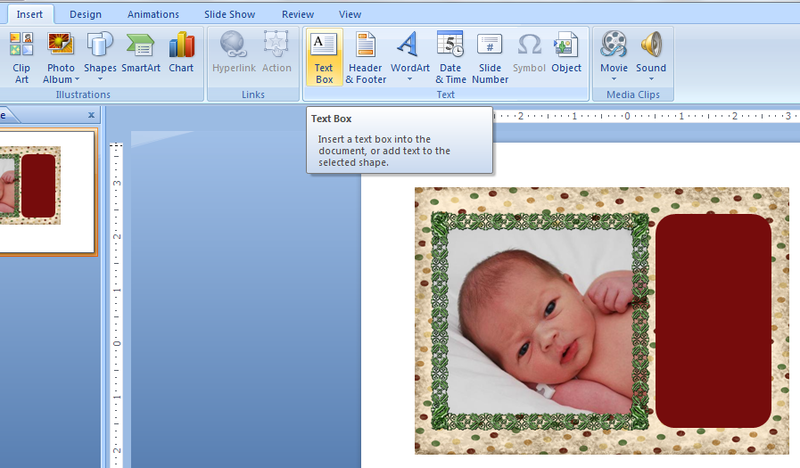 I have used powerpoint for years, but never knew how to save as a JPEG. I can think of so many ways to use this.